Style A three bay log store with doors and kindling shelf. This is built with a special roof on which the customer put his own tiles. He also fitted guttering. Price: Style A log stores are made-to-measure and priced individually based on the size required. All the pictures on this page are examples of units we have made for customers. The dimensions and price shown under each picture are given only as a guide. 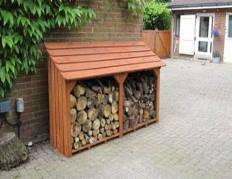 The log store can be built with just one bay or you can specify two or more. Prices, depending on size, range from £315 upwards and include VAT and delivery to much of mainland UK. Delivery to remoter areas, the islands and Ireland will cost a little more and this will be included is any quotation you request. Each unit is despatched as a self-assembly kit on a pallet complete with all fixings and illustrated instructions. Availability: The order lead time is two to three weeks, depending on size. To get a quotation: Select the quote button above or call us on 01691 648016. Please see the diagrams above for size options. The Log Store dimensions we need for a quotation are the width across the front at ground level, the overall height, the depth from front to back at ground level and the number of bays. Please let us know if you require a kindling shelf? NOTE: the roof overhangs 7cm (2.7 inches) to each side and 15cm (6 inches) to the front. Please allow for this when taking your measurements. If you can provide us with the measurements you require, we will prepare a log store design and give you a price and provisional delivery date. If the dimensions are unusual, we may contact you to discuss them and ensure that the resulting unit is practical for you to use. A kindling shelf can be included as an option where there is sufficient available height.